Posted on 17/05/2017 at 1:28 pm. 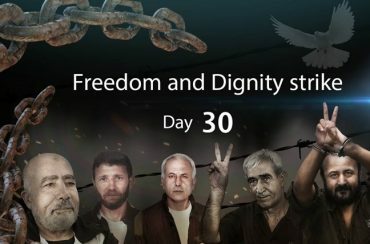 RAMALLAH (Ma’an) — As the mass “Freedom and Dignity” hunger strike in Israeli prisons entered its 30th day on Tuesday, the Palestinian Committee of Prisoners’ Affairs announced that leader of the strike Marwan Barghouthi will stop drinking water in response to Israel’s continued refusal to respond to the hunger strikers’ demands. Participants in the strike, now involving some 1,300 Palestinian prisoners, have been refusing food and vitamins since the strike began on April 17, drinking only a mixture of salt and water as sustenance. Hunger-striking prisoners are calling for an end to the denial of family visits, the right to pursue higher education, appropriate medical care and treatment, and an end to solitary confinement and administrative detention — imprisonment without charge or trial — among other demands for basic rights. According to the committee, Barghouthi insists on transparently achieving all of the demands made by the hunger-striking prisoners under his leadership, without bargaining or making compromises. The committee also called upon the United Nations Security Council and the General Assembly to hold an emergency meeting regarding the prisoners’ strike, to oblige the Israeli government to respect prisoners’ rights enshrined under international law, and to call on Israel to end its policy of inflicting a “slow death” on the Palestinian detainees. On Monday, reports emerged in Israeli media that Palestinian security officials and officials of Israel’s internal security agency, the Shin Bet, were attempting to reach an agreement that would end the hunger strike. As Israeli Public Security Minister Gilad Erdan has previously said the demands would only be addressed once the strike was ended, Palestinian officials warned their Israeli counterparts that such an approach would spark an escalation of popular protests that have been staged daily since the strike began — many of which have erupted into violent clashes. A statement released Tuesday by the media committee established to support the strike warned that striking detainees have “entered a critical health condition,” marked by chronic vomiting, vision impairment, fainting, and an average weight loss of 20 kilograms. “In spite of this, (hunger strikers) sent many messages confirming that they will continue the strike until their demands are achieved,” the statement affirmed. The media committee said that the Israel Prison Service (IPS) has continued to isolate strike participants from the outside world through the use of solitary confinement and restricting lawyer visits for the majority of detainees — in spite of a recent Israeli Supreme Court decision compelling IPS to lift the ban on lawyer visits, which was imposed since the first day of the strike. Hunger-striking prisoners have also been prohibited from receiving family visits outright, and face continuous arbitrary prison transfers in an IPS attempt to break up the strike. On Monday, IPS moved 36 hunger-striking prisoners from Ofer prison to a so-called field hospital at Hadarim prison, according to the media committee. The committee reiterated concerns about the field clinics — set up by Israel in anticipation of the mass hunger strike to avoid transferring the prisoners civilian hospitals. “In these clinics, the role of doctors resembles the role of jailers who offer all kinds of food to the sick detainees and bargain them to provide medical treatment in return for ending the strike,” the statement declared, denouncing the field hospitals as unfit and ill-equipped to provide medical care, and merely just another section for holding and pressuring the detainees to break their strikes. The hunger strike’s media committee also reported that the Independent Permanent Human Rights Commission of the Organization of Islamic Cooperation has called the group working on the cause of Palestine, during its meeting in Jeddah, to launch campaigns to support the Palestinian striking detainees and put pressure on Israel to respond to their demands. Meanwhile, Palestinian prisoners’ solidarity network Samiduon highlighted that Palestinian circus performer Muhammed Abu Sakha, has been participating in the strike since its first day. Abu Sakha has been held without trial or charges since December 2015, which has inspired an international campaign demanding his immediate release. Palestinian prisoners’ rights group Addameer reported on Thursday that following the expiration of Abu Sakha’s detention on June 11, the Israel’s Supreme Court decided to limit the extension of his detention to three months, following a successful petition by his lawyer. Abu Sakha is among 500 of the 6,300 Palestinian prisoners held under administrative detention, according to Addameer. Travel Palestine is the Official Site for Tourism in Palestine which offers you as a visitor in Palestine everything from travel essentials to ideas for activities, destinations and accommodation. The site can also be found on Facebook, Twitter and YouTube.